Heading for his Sunflower Trophy races debut is 35-year-old Hawk Racing Buildbase Suzuki rider Richard Cooper. The Nottingham rider was in great form at the recent BSB meeting at Assen in Holland, where in the second race he finished 5th, just two seconds behind current Sunflower Trophy Holder Glenn Irwin (PBM Be Wiser Ducati). Cooper currently lies joint 13th in the ultra-competitive BSB Championship, just 8 points behind Michael Laverty (TYCO BMW). 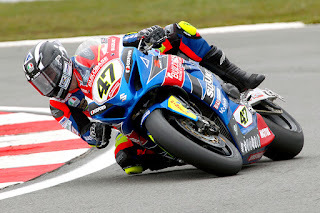 Now in his 19th season, Cooper was the BMW Boxer Champion in 2005, and British Superstock champion in 2011. 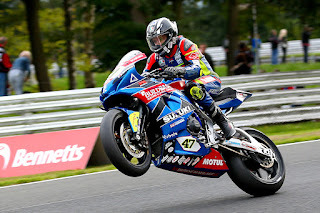 Hawk Racing Buildbase Suzuki, under the guidance of Stuart Hicken are no strangers to this event, but are still looking for their first win at this popular end of season event . Richard Cooper has tried to get to the Sunflower on various occasions, but events he was contracted to often clashed with the Sunflower meeting, and this year is the first time his diary is free. Buildbase Suzuki will be bringing another, yet unnamed rider to the Sunflower.